Over the years, we have seen fire art in many forms - flamethrowers, fountains, trees dripping flames. Mobile, stationary, some small, some large. Here's a new take - fire art on a macro scale; fire art that will use the larger expanse of the playa as a canvas. 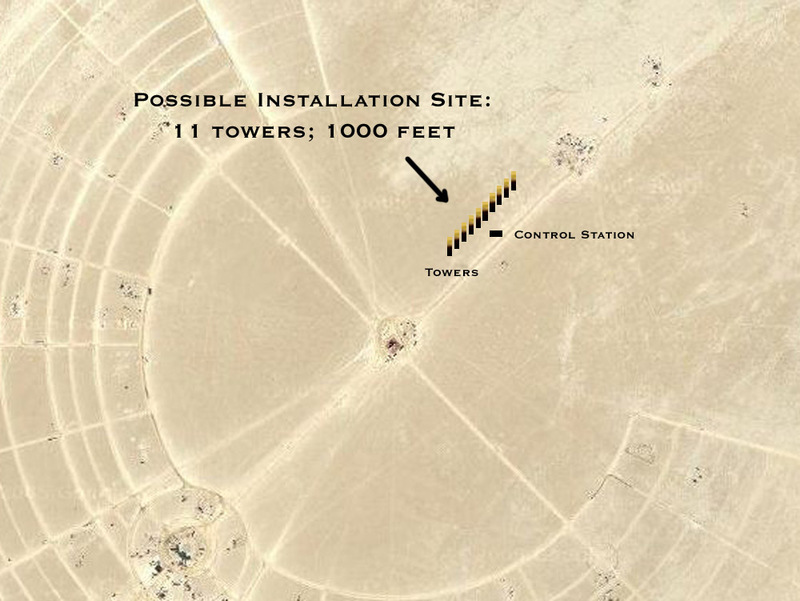 This is the idea - stretch a series of towers in a line 1000 or more feet long, which can produce computer-sequenced patterns of flame visible anywhere across the Black Rock City. The computer control allows any or all towers to be individually fired at a very high rate of speed (around 0.1 seconds) and in any pattern. The resulting sequences can be simple lines of flame that stretch the entire length; explosions can chase from one end to the other at a great apparent speed; continual patterns can run back and forth across the line; patterns can occupy the entire space between the ends. These sequences will be beautiful while standing under the towers on the pathway, but from another viewpoint - will be visible for miles across the playa, as well as for miles above. This piece should be powerful, beautiful, visible across the entire city, and (as will be described later) - interactive. Participants will be able to see the beauty of, as well as feel the power of the installation. The installation will be run several times per night during the event, as many as possible given propane supplies and when the tanks begin to freeze. Fire art has traditionally been a 'black art' - installations are typically shrouded in some secrecy, participants are not allowed near the installations, no one will tell you how they work, and just the power of the flames usually keeps people away from the art. Here participants will be allowed (under controlled circumstances of course!) to operate the controls and feel the power of directing the flames. It was surprising to find out how much this interactivity meant to many participants with the smaller prototype Burninator. People are often thrilled to be able to operate the flames, and surprised that they are allowed even close to the controls. This will not only be interactive flame art, but interactive flame art on a huge scale. This installation can be an example of how flame art can be safely interactive. This project has already been realized on a small scale last year. The 'Burninator' was a compact version, only 20 feet from end to end. However, all the critical components were developed and tested, and will translate to the larger version: the software, control board, wind-resistant igniters. The scaling up of the flame and nozzle sytem, and the towers, will be fully designed and tested in the bay area in the months before the event. Propane supplied from multiple 25 gallon (100#) tanks. Flame is unoxidized (yellow) propane flame. Operating height of flame is 20-30 feet. Multiple sets until main tanks freeze. There is definitely an environmental impact from using nearly 3 tons of propane for an art exhibit. Apart from not using the fuel at all, one of the only ways to partially mitigate the negative effects is to offset them in other ways. The greatest impact will be the 20 to 30 thousand pounds of carbon dioxide generated. This will be offset by contributions to Terrapass (www.terrapass.com) and NativeEnergy (www.nativeenergy.com). These organizations guarantee that the amount of CO2 paid for will not be generated, by contributing to the cost of alternate energy sources. Cleanup will be trivial. No residue from the flames will ever touch the playa. The only damage to the playa will be from the minimal narrow trench made for the wire; this will be filled and compacted completely. All other materials can be broken down simply and will be removed. main cutoff switch will be located at the console. Bill Codding has built and displayed propane fire art at Burning Man, Decompression, the San Francisco Fire Arts Expo, Oakland's Crucible Fire Arts Festival, and others. His work has been inspected and approved by the fire marshals of the communities in association with these displays, and he has held previous flame effects permits in association with those displays. copyright ©bill codding 2002-2006. all rights reserved.